The tagline of ALTBalaji's new show Home says, "It's a feeling." But Habib Faisal's offering is as much about survival in a cut-throat world as it is about feelings. While it does highlight the indispensability of emotions, particularly in times of crisis, it does not shy away from mirroring the reality that roti, kapda aur makaan are as much a necessity. The show revolves around the Sethi family, who reside in an unauthorised Mumbai locality Kala Kruti Society. Either oblivious or ignorant of the society's legal status, the Sethis go on to live their middle-class life with everyday mundanity. Himansh Sethi (Annu Kapoor) joins a travel agency after his own venture falls flat. His wife Vandana (Supriya Pilgaonkar) starts a dabba business in order to supplement her husband's income. 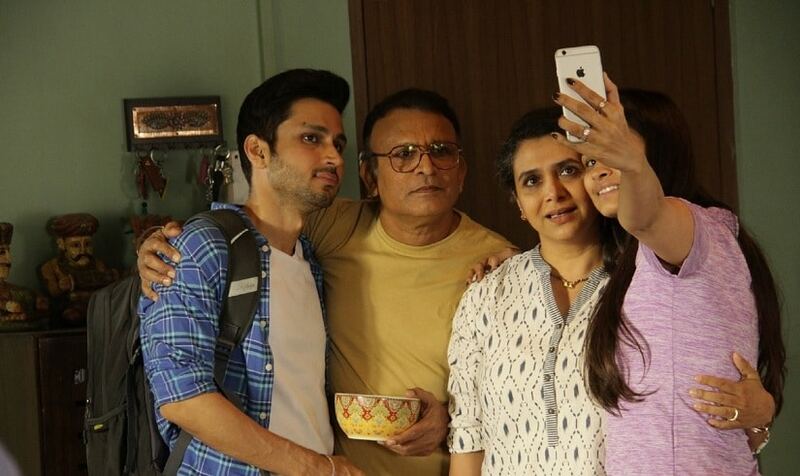 Their son Vansh (Amol Parashar) has finished schooling and desperately wants to migrate to the US for a better living standard, despite being aware of the financial crunch that his family is undergoing. His sister Hina (Chetna Pande) repents marrying her alcoholic boyfriend and moves back to her home after a fallout. To make matters worse for the family grappling with their personal issues, the patriarch Brij Sethi (Parikshit Sahni), Himansh's father, who is a lawyer, sues the Brihanmumbai Municipal Corporation (BMC) for charging the Kala Kruti Society for water supply, even though there was no actual supply for the past three months. However, the tables turn on Brij as the judge passes a demolition order, with immediate effect, of the illegally constructed society. All consequent efforts to grease the babus' palms and requests for compassion fail, prompting the entire housing society to turn on the Sethi family. The most refreshing part about Home is that it deviates from falling prey to the mainstream trappings of a conventional family drama. From the way the family talk to each other (with Marathi words and internet slang peppered all over) to how the narrative progresses, the direction seems like a breath of fresh air. *Spoiler alert* For example, not every heart attack ends in a death. Or not every symptom of cancer turns out to be malignant *Spoiler alert ends*. Besides a dash of realism, what is interesting to observe from these crests and troughs in the narrative graph is the way the family come closer in hard times, only to go back to their cocoons when the tragedy passes. The most claustrophobic cocoon out of these is that of Hina. The trope of drifting towards your ex-boyfriend after separation from husband is done to death. Her boyfriend's allegation that she is a gold-digger and hence, is willing to choose a rich alcoholic husband over a middle-class boyfriend, could have added a shade to her otherwise uni-dimensional personality. But the makers do not explore that angle further. For her subconscious to get lured by rich men makes sense, given the financial troubles her family had faced. It is similar to her brother Vansh having more affinity towards his well-off uncle rather than his dad, whom he considers a failure. Clearly, he is willing to trespass the boundaries set by his father in order to live his American Dream. While Chetna is a little uninspired and Amol immensely promising, the show hinges on seasoned veterans Annu and Supriya. Supriya is particularly brilliant, since this is her meatiest role in recent memory. She slips into the humble shoes of a middle-class Mumbai homemaker with consummate ease, sporting her grey hair and unadorned face with a sense of ownership. The make-up would have done little justice to her unblemished expressions. She knows exactly which button to push for every reaction, with her wrinkles and folds ensuring that the outcome is not even remotely formulaic. Similarly, Annu balances the sternness of a father with the tenderness of a supportive husband. His exchanges with Supriya feel real, though they possess an undercurrent of love that belongs to the unreal. He defies the everyman tropes with conviction, and channels the character's insecurities and regrets with palpable compassion. Sahni, who plays his father, does play the usual senile old man stereotype, but also shows his goods in the quieter scenes. The scene where he holds on, with all his waning might, to the handle of the society's elevator door, does justice to both the director's vision and Sahni's heft as an actor. The first season is mostly set behind closed doors but the second one is likely to take the internal fight to an external level, when the entire society would congregate to save their home. It is likely to delve more on the huge supporting cast essaying other families living in the society, who merely hover around the Sethi family in the first season. Season 2 is also likely to be a more direct social comment on the nexus between politicians and builders. Habib restrains from diving into the action at the onset and takes his own sweet time to explore the familial dynamics, before he can graduate to the societal. The audience is sure to feel empathy for the Sethi family when they confront the impending demolition in the next season. But for a show titled Home, one barely remembers anything of the physical space they are so desperately trying to protect. The production design and cinematography rarely admire, or even notice, the little things that make home. If the director's idea behind the same was to prioritise feelings over materialism, he may have succeeded. This writer is willing to give him the benefit of doubt, for he makes it clear every now and then that home is not just a feeling, but also the most basic of one's needs.